St Flannan's School in Zillmere have won the inaugural Dance Fever for Daniel competition. Dancefever Multisport presented a significant $10,000 cheque to St Fannan's for producing the most outstanding video. 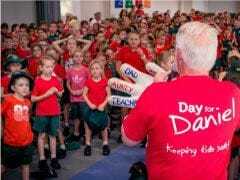 The Dance Fever for Daniel Competition was organised by Dancefever Multisport and supported by the Daniel Morcombe Foundation as part of 'Day for Daniel' 2015. The competition was open to all schools in Queensland and New South Wales. The competition was a video production that focused on Child Safety and Movement. Schools designed, performed and filmed a video production within their school premises such as school hall, stage, classroom and playground. There was no competition entry fee. Dance Fever for Daniel Competition video production covered a variety of curriculum content across The Arts and Health and Physical Education within the Australian Curriculum. Maria Russo said "The aim of this competition was to bring greater awareness and importance of child safety and movement for children within primary schools. We were really impressed by the quality and content of the video's that were submitted"
Denise Morcombe added "It was a wonderful initiative for students to learn in a fun way, incorporating our safety messages 'Recognise, React and Report'". The 12th Annual 'Day for Daniel' will be held on Friday 28th October 2016. Parents, carers, educators can visit the 'Day for Daniel' website for resources and information on how to keep kids safe.